Paddy Power Casino are celebrating the fact they launched some great new video slots by giving away £10,000 in bonuses and £2,000 worth of free spins. The £12,000 Prize Draw promotion runs until tomorrow – Sunday the 10th of June 2018. To take part, you need to opt in (via the ‘Promotions’ section) and then wager a minimum of £10 on the eligible Playtech video slots to earn tickets. There are no limits to how many tickets you can enter with double tickets possible by playing certain video slots on certain days. If you take today for example, playing Legend of the Jaguar will give you double tickets for every £10 you stake. Tomorrow, all the eligible games will give you double tickets! When it comes to the eligible video slots, they include Gem Burst, Satsumo’s Revenge, Fiesta De La Memoria, Raiders of the Hidden Realm and Legend of the Jaguar. Now, if you win a bonus, it will be added to your account after 6pm on Monday the 11th of June (2018) – the bonus comes with just 3x wagering requirements. As well as the bonuses outlined above, Paddy Power Casino will randomly add free spins to players who haven’t won a bonus prizes – between 5 and 50 free spins will be credited randomly after 6pm on Monday. The free spins will be valid on Playtech’s Batman Begins and come with no wagering requirements. 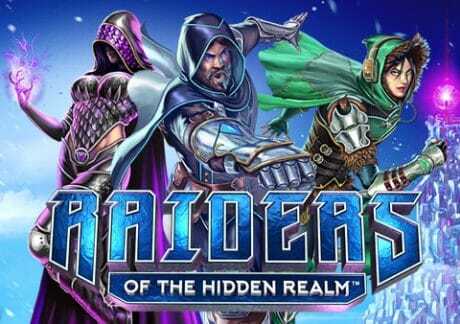 Of the video slots eligible for the promotion, our number 1 choice is Raiders of the Hidden Realm – with 5 reels and 40 paylines, you join Morgana, Sparks and Striker in this epic offering which offers you a shuffle feature to give you guaranteed wins. It comes with 3 free spins features that reward you with high value Morgana symbols, frozen wild symbols and multipliers up to 25x. Sign up now to choose from 2 welcome offers – for a deposit of just £10, you will get a £40 bonus as well as 20 free spins on Playtech’s Space Invaders. If you want to deposit a little more, you can get a 200% bonus up to £200 – i.e. deposit £100, get a £200 bonus. © 2009-2018 CasinoManual.co.uk – Play Slots Online & Read Slot Reviews. CasinoManual.co.uk – your independent guide to the best UK online casinos.